Home » What is Gaia? Gaia is a satellite by the European Space Agency (ESA),which main goal is to make the largest, most precise three-dimensional map of our Galaxy by surveying a billion stars (about one per cent of its population) with an unprecedented precision in position (of the order of microarcsecond, equivalent to distinguish a coin located on the surface of the Moon from Earth) and motion. The astrophysical parameters of the stars (temperature, size, composition, …) will also be obtained thanks to photometric measurements. With all these data, Gaia will be able to clarify the structure, formation and evolution of our Galaxy. Due to the successful (Hipparcos mission, 1993), the idea of the Gaia mission was beginning to take shape (1993) in order to get the maximum return from the concept just tested with Hipparcos. In 1999, the Concept & Technology Study was presented and the mission was accepted in 2000 by the ESA Science Programme Committee. Gaia was originally foreseen to be launched by Ariane 5, but a further industrial study was carried out in early 2002 to assess accommodation within the smaller (and cheaper) Soyuz launcher. From 2002 and 2005, industrial technology studies (Phase B1) were done in collaboration with scientists in order to ensure the feasibility of reaching the scientific goals with existing technology. In 2006, the primary contract to build the satellite was assigned to EADS Astrium SAS. Some parts of the satellite were constructed by other companies all around Europe. Also in 2006, DPAC consortium was created to be prepared for data handling during the operational phase of the mission. In 2009, the Gaia torus is completed and the deployable sun-shield assembly and the unit responsible for the real-time processing and commanding of star data transmitted (VPU) were tested. 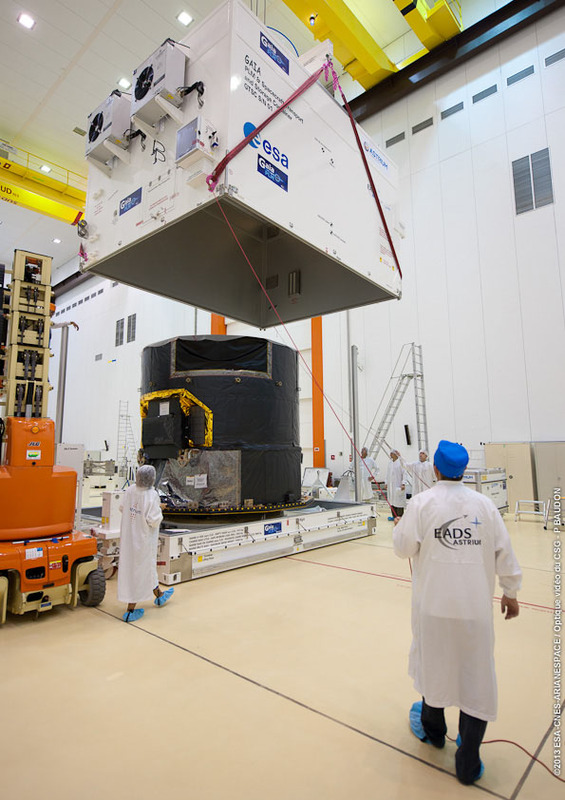 In 2010, all Gaia CCD were delivered, the first mirrors were completed and the Soyuz launch facilities at the European space port in Kourou, French Guiana, were near completion. In 2011, the sun-shield deployment tests were successfully completed. 10 mirrors were already built. All CCDs mounted in the focal plane structure. The payload vibration tests were successfully passed. The first Soyuz launch from Kourou with the same configuration to be used by Gaia was successfully done. In 2012, a new tracking station from ground was assigned to Gaia (Malargüe in Argentina) to be added to the other two already available (New Norcia in Australia and Cebreros in Spain). Launcher separation, payload module vibration tests and service module thermal testing were completed. Basic Angle Monitor and Gaia Phased Array Antenna were delivered and integrated into the Service Module. In 2013, the Flight Model Payload Module thermal testing and Data Handling Unit were completed. On August 23rd, Gaia arrived to Kourou (French Guiana) where It will finally be launched. Everything is ready for the launch of Gaia. Gaia was launched from Europe’s Spaceport in French Guiana by a Soyuz-Fregat launch vehicle on 19 December 2013 (09:12:19 UTC). After a 30 days voyage, Gaia reached an orbit around the L2 point of Sun-Earth system (at 1.5 million km distance from Earth in the opposite direction of the Sun) where It is obtaining its data for a period of 5-6 years. Gaia data is released as soon as all the processing and verification is done. CU9 is the DPAC Unit responsible to deliver Gaia data. Third release (Launch + 40 months): Orbital solutions of binary systems. BP/RP/RVS spectra delivered for those objects with good astrophysical parameters determined. Fourth release (Launch + 65 months): Variable stars classification with epoch photometry, orbital solutions for Solar System objects and non-single objects catalogue. Full astrometric, photometric, and radial-velocity catalogues. All available variable-star and non-single-star solutions. Source classifications (probabilities) plus multiple astrophysical parameters (derived from BP/RP, RVS, and astrometry) for stars, unresolved binaries, galaxies, and quasars. Some parameters may not be available for faint(er) stars. All epoch and transit data for all sources. All ground-based observations made for data-processing purposes.